The Biology of Luck has so much going for it, but the truth is that it has its detractors as well. The gimmick here is that our main character (Larry) is in love with a girl (Starshine) and he is finally getting his first date with her tonight. How exciting for him! Larry is also an unpublished author who has recently submitted his first novel to a literary agency and he’s waiting until after his date with Starshine to open the letter he’s just received from said agency. Will it be a yes, or will it be a rejection? I’m on the edge of my seat! Oh, but wait a minute! Just what is Larry’s novel about, you ask? The novel is about the very same girl he is in love with and it takes place on the very same day she is having her first date with him. That’s…interesting. In a confusing sort of way. Now the chapters flip flop from the real-world day of Larry to the fictional-world day of Starshine. It’s a smart and original concept, if done correctly. Unfortunately I just don’t think the gimmick works. Readers could easily read the Starshine chapters as simply alternate POV chapters from Appel’s work of fiction. There simply seems to be no need for this “fictional” side of the story. Appel’s voice is identical to that of Larry’s and there’s far too many coincidental instances where readers will stop and think, “there’s just no way the Larry could have written these events months ago! These are the very same events that are actually happening!” But maybe it’s just lucky, as the title would have us believe. Appel’s writing is beautiful and there were many sentences I got lost in (in a good way). However, his writing simultaneously suffers from “look-what-I-can-do-syndrome” and the over-flowery exposition had me lost many times (in a bad way). I had to re-read multiple sentences because I felt like I’d been thrown off-track from the story. 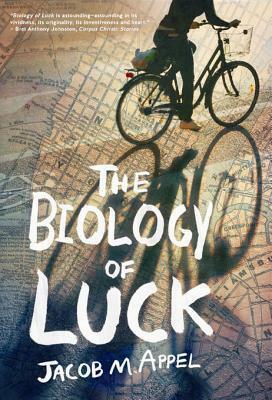 Still, there is a LOT to be excited about with The Biology of Luck. If you enjoy an off-beat love story with extremely memorable characters (the secondaries especially), a generous helping of humor, wonderful prose and a guided tour of New York City to boot, then this is the book for you. This entry was posted in Book Reviews and tagged Book Reviews, Fiction, Jacob M. Appel. Bookmark the permalink.